Gypsy Rose is amazing. In truth, I think it’s all because of the yarn I used which although discontinued (Julia yarn), is now available again from Colours by Kristin – the amazing US designer Kristin Nicholas. I had the wool shipped over when it was on sale as discontinued stock, from Webs. I always use pure yarns, without any synthetic content but I have no idea where you would be able to buy such colours in pure stock in the UK. If you find a stockist then do post a comment so we can all explore! I used double knitting and a 4 mm crochet hook. As you can see from the close up of the block below, I changed colour with every round. Row 2: 3 ch (as first treble), then treble 11 into the circle, so you have 12 stitches in the circle. Row 3: slip stitch into a space between trebles, then 3 ch (as first treble) and 1 tr into same space, 1 ch – continue around with 2 tr followed by 1 ch until you’re all the way round and join up with a slip-stitch. Row 4: slip stitch into a space between trebles, then 3 ch (as first treble) and treble into same space, 1 ch; 2 tr and 1 ch into next gap and then 2 tr, 4 ch, 2 tr into next gap – to make a corner. Continue with 2 tr, 1 ch twice and then make another corner. You can count it out first and mark up the corners with a pin if you’re not sure, but you should end up with it looking like the purple row above. Row 4: it’s easy, just double crochet into every stitch in a contrasting colour making 2 dc, 4 ch into each corner space. This row spells out the change from circle to square. Row 5: 3 ch (as first treble) then do 14 trebles down each side – that’s one into every stitch in the previous row and 2 into the corner with 3 ch at the corner space. (I find that 3 ch does well in the final corner, 4 makes it a bit loopy). Are you done? Let me know if all that made sense. I’ve kept it fairly simple as I’m a firm believer in learning how it feels to make a block, rather than simply following a pattern. I made quite a few sample blocks before settling on this one – I’m sure this pattern has been used before, but I made it up for me. Each square measured about 3.75″. 36 blocks (6 x 6 square) and I joined them with a needle and yarn, by placing right sides together and doing running stitch from the wrong side. I’m not sure I’d do this again, but I’m certainly not unpicking it now! I’ve since become a huge fan of joining as you go and I’ll show you how to do that another time. This border has attracted SOoooo much interest and is incredibly simple. I used a different colour for every row; 28 rows in total. Border Row 1: double crochet into every stitch around the edge, making a corner with 4 ch. Border Row 2 – 28: 3 ch (for 1st dc and 1 ch); then into every alternate stitch do 1 dc followed by 1 ch. It’s that simple. Build the rows by doing every dc into the ch space from the previous row. Don’t forget to slip-stitch together at the end. Read about what I learned about using colours here. Shell Border: I used the same colour for the final 2 rows of the border and the shells. Shell Border Row 2: 3 ch for first tr then 1 ch; continue all the way round by doing 1 tr into every alternate stitch from the previous row, followed by 1 ch. 4 ch at the corners. Slip-stitch final stitch together. Shell Border Row 3: 5 ch miss 2 of the ch spaces from the previous row, then dc into every 3rd ch space. You may have to twiddle a bit at the corners, but trust me – nobody will ever notice if you’ve got an extra space. I did a dc into the last ch space before each corner, then 5 ch, dc into the corner ch space, 5 ch then dc into the first ch space of the next side. Shells Border Row 4: Slip stitch into first 5 ch space then 1 dc, 2 htr, 3 tr, 2htr, 1 dc into each ch space followed by a slip-stitch into the double crochet stitch from the previous row. Make the shells in every 5 ch space all the way around. Be warned – this is a yarn-guzzler of a stitch. And finally … the last row I worked in a vibrant contrast colour. It’s very simple, just dc into every stitch from the previous row of shells, but here’s the trick: TURN your blanket around so the back is facing you. Then dc with your contrast yarn. Why? Well, if you make dc’s into the shell, the border will turn up at the edges. By turning the blanket around, it actually turns the shells backwards at the edge, so they don’t curl. Read Gypsy Rose ta-dah post here. 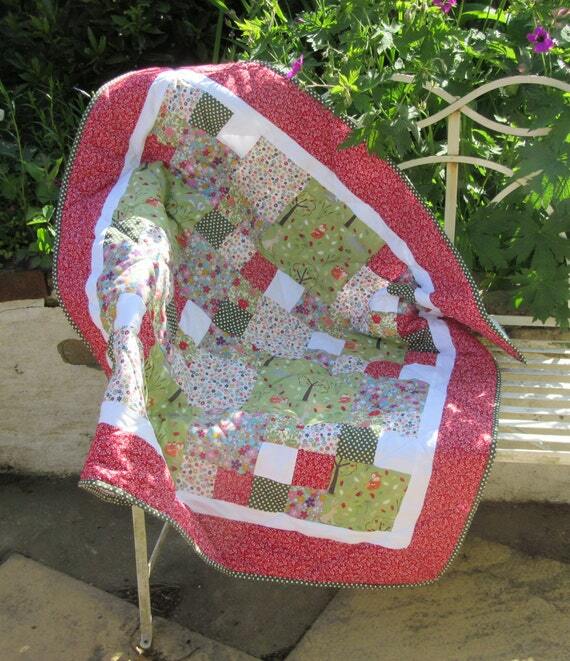 Block your blanket by stretching then pinning onto a plump mattress of towels or a quilt maybe. Spray with a houseplant spray filled with water, all over and leave for a couple of days to dry. I’m very bad at blocking and admit that I put 2 towels on the ironing board then lightly steamed it on the wrong side. This works for me, but blocking I’m told is the best way to do it. PLEASE let me know how you get on and if these instructions are OK for you to follow. Do send me photos of your projects too. Check out my website and workshops, blog and meet me at markets. I love this, when I have time I shall have to give it a go! It grew really fast and would have been even quicker if I’d joined the squares as I went along. The border runs out really quick too, despite only being double crochet. I finally finished it in a Tesco car park, waiting for my husband to do the shopping on our way to the holiday cottage! I simply had to stay in the car to look after the dogs – excuses, excuses!!! Gorgeous, absolutely gorgeous the colors, the trim, you are truly amazing!! This is incredibly beautiful. Would you be willing to share a more detailed pattern ( colors used etc.) ? I would love to make this. Oh my goodness – it would be like a book. Just put colours together that you like – let them talk to you – just listen. If you choose beautiful colours & top quality yarn (I had about 14 in total), then it will look amazing. I repeated a few of my favourite colour combinations but most are unique. Be brave and go for it. I am so happy you have posted this tutorial. I bookmarked your Gypsy Rose when Kristin first posted about it on her blog, and revisit the photos periodically for dreaming purposes! I, too, ordered some of Kristin’s ‘Julia’ yarn when it went on discontinued sale at Webs. Now it’s time to get started on my own blanket. I look forward to the flickr page. Thanks again! Hope some of the “lookers” actually become “doers”! I’m a gonna do ‘er! I just got my yarn! Good luck with your Gypsy Rose. Send me a photo when it’s done! I have just started this blanket! Found it on pintrest and loved it! I am a self taught beginner so hoping this will help me hone my skills so I can move on to other things! 🙂 thanks for the pattern! Good luck – it’s quite straightforward once you get into it. I’d have joined the squares as I go, if I was doing it again – would save lots of sewing up! 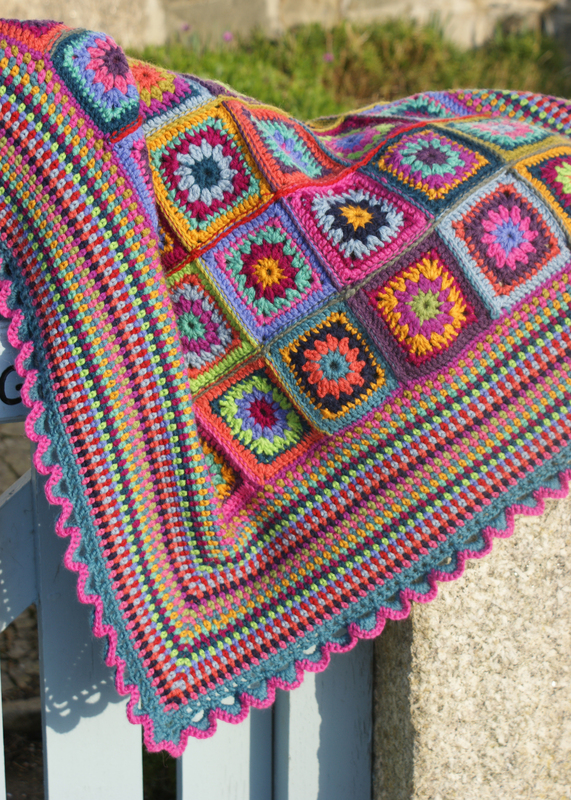 It’s still my favourite blanket – the border is well worth the effort. Do let me know if you have any questions. I LOVE ,LOVE,LOVE, your blanket!!!!. I am also new to crocheting and learning about different yarns. Was the yarn that you used Color by Kristin 50 wool,50 mohair, and 50 alpaca? I know this is a lot to ask but as a newbie, I have a tendency to get confused about converting from “English” to “American” pattern speak. Could you PLEASE (really) send me the American pattern version. I have been trying to make a ripple and have JUST GIVEN UP because my ends do not turn out, so I want to try to make your beautiful blanket. I spent an outrageous amount of time trying different patterns and I must not have a ripple gene! Btw my daughter lives in York and it is for her and her handsome English hubby. We are flying over the end of May and I would really like to give this gift to them. Please help a girl out! Thank you ever much. and a chain is a chain! 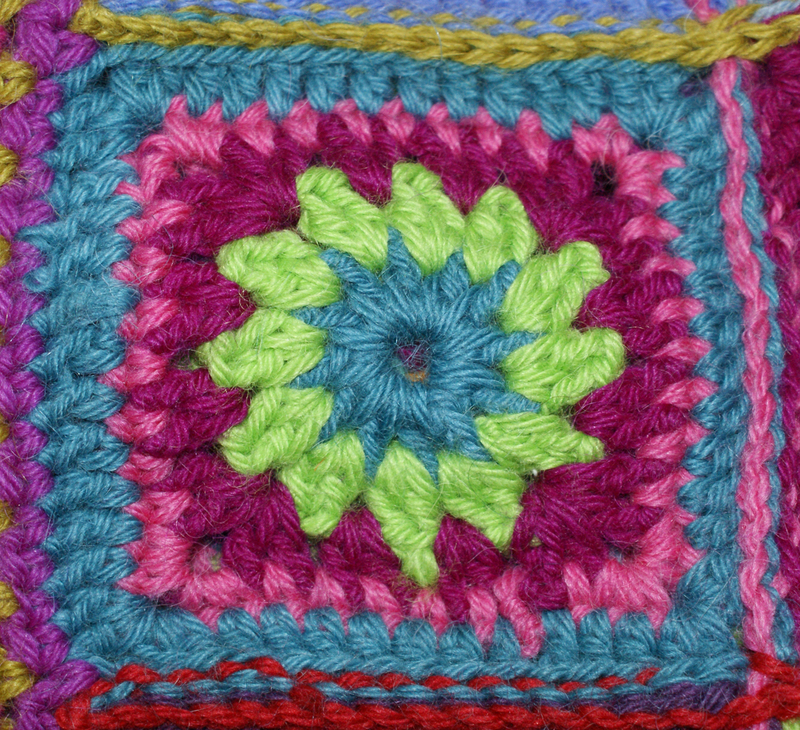 Have a look on Ravelry and sign up for it – there’s everything on that website. There are also so many online tutorials, on YouTube that will explain it so much better than me. Good luck! When working with multiple colors I always have trouble getting the ends tied off and weaved in so they don’t stick out. It’s the only think holding me back from making this beautiful blanket. Any tips? I tried to complete 4 squares in an evening, then do the ends either as a ‘relaxing’ wind-down before bedtime, or as a boring warm-up the following evening. I couldn’t have coped with thousands of ends at the very end of the project. It worked for me ‘cos then I made Misty Morning, and Carnival – and Ripple One! They all had lots of ends. I have almost finished the blanket! I am having a hard time with the rows at this point. I read ch 4 to make a corner for row one. (ok i get that) but rows 2 on are you dc on one side of the corner ch 1 then dc again in the corner “hole”? Then row 3 doing only 1 dc in the middle of the the first two made?? Kinda confused, hopes that makes sense. I’ll have to have a look and see what I can remember from the blanket itself! I made it years ago now. I’ll send you a photo close up of the corner so you can see how I did it. Do send me a photo of your blanket too. I also need corner help on the Gypsy blanket! Is there a close-up photo of it so I can figure it out? Thank you! https://adaliza.com/2012/01/30/between-the-lines/ The corner of the edging is simply made with 3 or 4-chain turn, as far as I recall. I kept it very ‘tight’. I didn’t write down the pattern as I simply made it up as I went along. This is my first time visiting your site. Love your designs and use of color! Was wondering if you could share the modified tweed stitch you used for the stool cover? I’m able to follow your well-written tutorial for the basic tweed stitch – but I really like how you modified it for the stool cover. I’ll do a tutorial next week – am away at the moment and will have to get the stool out to see what I did! That’s really sweet of you :-). I hope it won’t be too much trouble. I have just found this amazing blanket on pinterest, thank you so much for sharing this pattern. Love the name of the blanket too, its my dogs name! I will be awhile starting this as I will have to save up and get the wool, I am in Australia so shall see what yarns I can get. Thank you so much again for this pattern you have chosen to share so we can all have an heirloom of such beauty. Hi Vanessa, I am in Australia also and am on the hunt for wool. What did you find? I am just finishing my son’s Afghan in small squares in 100% acrylic (perfect for the tropics and easy for a boy to throw in the washing machine) but my daughter is moving to Bendigo and will need a rug of 100% warm. I am making this one but am looking for some advice. Good luck with your wool hunt. I’ve made other jazzy blankets – see Carnival – you can use darker/more ordinary colours but to make it sing you’ll need something zingy in every block – like yellow, lime, fuschia – it makes all the difference. Hi Janice, I used 4 Seasons Pure Wool Entwine 8ply 100% Australian wool from Spotlight. They have a good range of colors in this brand and it made up nicely using a 5mm hook. Love Bendigo such an arty place. Happy crocheting! Glad you’ve found good yarn out there. Send me a photo of your blankets – I’d love to see them! I had the same and just added in a few extra stitches to compensate I think. Also, blocking it at the end gets rid of lots of problems. Have just finish! How do I send you a photo, my friend loved it! Her baby is due soon. Well done – I’m so pleased you’ve completed it. I can’t wait to see your photo. Thanks Kalli – an oversight! Hello! I’ve just come across your beautiful blanket courtesy of Attic 24 and can’t wait to give it a go. In fact I’m going make a square this afternoon and so a HUGE thanks for your clear tutorial. You mentioned posting a tutorial on the join as you go method. 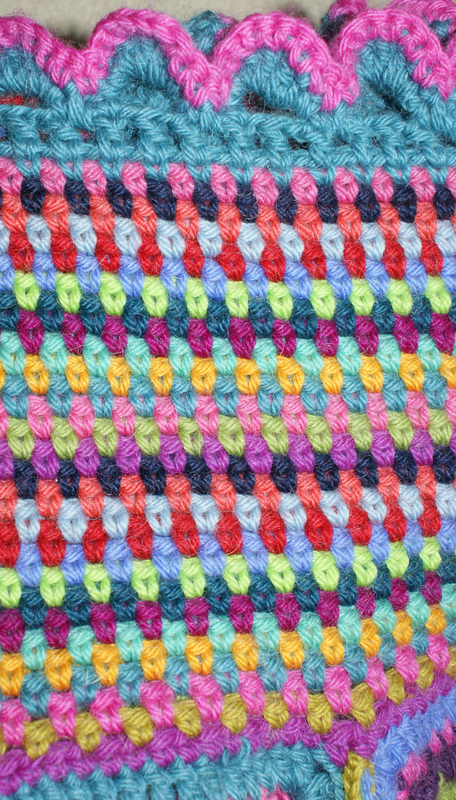 I’ve only ever used this for joining granny squares – can you point me to your tutorial or advise on how to use the method with your squares. Thanks again for the joy and inspiration! So pleased you’ve found Gypsy Rose – and my blog. I think Attic24 has a brilliant tutorial on join-as-you-go. I picked it up from there! Very interested in yr gypsy rose blanket . Pls tell me the title of the crochet book . I m very keen to buy this pattern book. My pattern is on my tutorials part of my blog and is free. Enjoy making your very own Gypsy Rose! The first row of the border at the corners we chain four,2nd row how many stitches I do in this four chains. Hi Margot – the same, 4 chains in the corners for all subsequent rows. Hello Adaliza from the other side of the pond! I love this pattern and can’t wait to sink my teeth into! What I love most are all the different things going on that just fit together. The granny squares then the rows of lovely stitchs and last such a pretty border to end with. Really just lovely and I am very excited to get to it! Have a blessed day. Greetings from sunny Palm Beach, Florida!! I have happily stumbled upon your beautiful Gypsy Rose blanket. Once I finish up a couple of gift projects I would love to do your blanket. Would you have a guesstimate on how many skeins of yarn I would need to purchase for this blanket? Any guidance you can provide me with is greatly appreciated. Thank you! Hi Leigh – gosh, it’s a long time ago that I made Gypsy Rose. I’ve just read my notes and I think I had about 14 balls of different colours but I had yarn left over so didn’t use it all. It’s not a huge blanket but you could make it bigger and use up all the yarn. Good luck! Thank you, Adaliza. My plan is to make a queen size blanket for my sister. I will use the 14 skeins you had and incorporate the amount of yarn I’ve used on other queensize afghans I’ve made. Thank you for suppyling me with a baseline. When it is completed I will absolutely share a picture with you. Thank you, again. I so appreciate your response. Hi Dolly – I’m sorry, I don’t sell my crochet blankets. Why not join a class and learn how to make one yourself?